Rembrandt Harmensz. 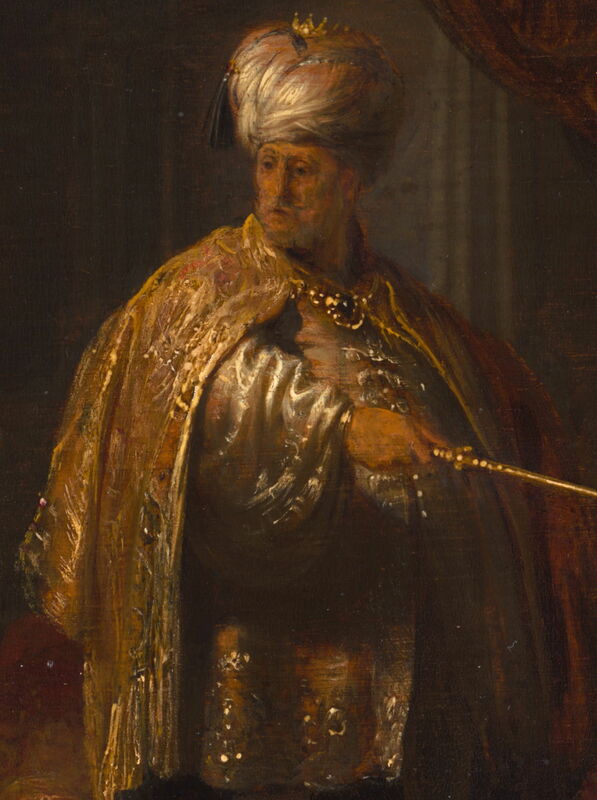 van Rijn (1606-1669), Daniel and Cyrus before the Idol Bel (detail) (1633), oil on panel, 23.5 x 30.2 cm, The J. Paul Getty Museum, Los Angeles, CA. Courtesy of the Getty Center, via Wikimedia Commons. Western painting has been remarkably selective about its heroes and legends. Even quite minor and obscure Greek and Roman figures can end up in dozens of fine paintings, now admired by crowds visiting galleries around the world. Ruling the largest empire in the ancient Near East, as did Cyrus the Great between about 550 and 530 BCE, does not qualify you a place in art history, although two superb paintings by Masters may be a help. This article and the next (publishing tomorrow) look at paintings of Cyrus the Great in life, and death. Cyrus II of Persia was the King of Kings, and the King of the Four Corners of the World. At its height, his empire stretched from the Hellespont, at the eastern edge of the Greek civilisation, to the Indus River, and swallowed up Persia, Media, Lydia, and Babylon. Oddly, his childhood has been depicted not infrequently by European artists, thanks to a gruesome legendary account by Herodotus. During his mother’s pregnancy, her father, Astyages the King of Media, had two prophetic dreams, which were interpreted for him as warning that his grandson would one day replace him as king. Astyages summoned his daughter Mandane back to his capital so that he could have her child killed after birth. The task was delegated by an advisor to Mithridates, a shepherd, whose wife had a stillborn son; the shepherd passed the dead baby off as Mandane’s, and raised Cyrus in secret as his own. Sebastiano Ricci (1659–1734), The Childhood of Cyrus the Great (1706-08), oil on canvas, 259 × 201 cm, Kunsthalle, Hamburg, Germany. Wikimedia Commons. 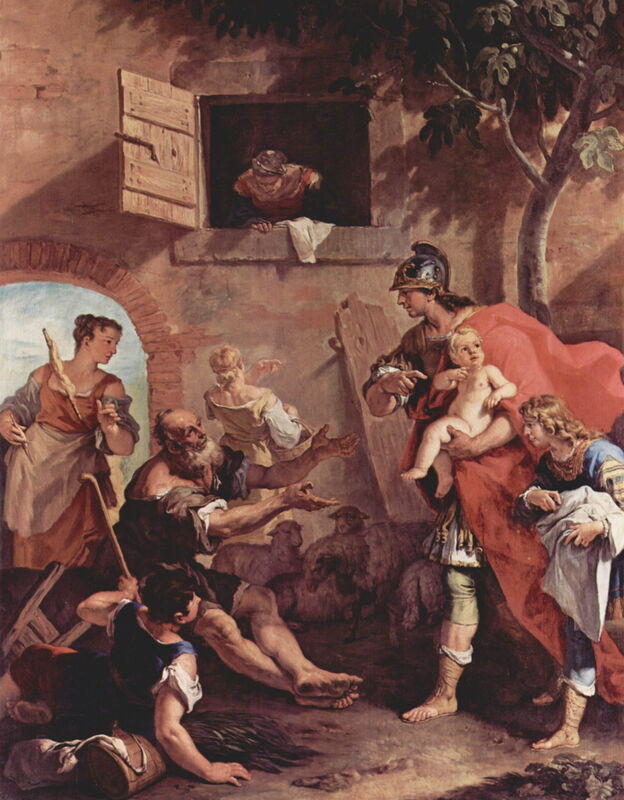 Sebastiano Ricci’s painting of The Childhood of Cyrus the Great (1706-08) shows Astyages’ advisor Harpagus handing the infant Cyrus over to the shepherd Mithridates. Behind, there is a discussion going on between two women, one stood beneath a window, the other leaning out of that window; they are arranging the substitution of the stillborn son to be returned to Astyages as evidence of his grandson’s death. Jean-Charles Nicaise Perrin (1754–1831), Cyrus and Astyages (c 1790), oil on canvas, dimensions not known, Private collection. Wikimedia Commons. 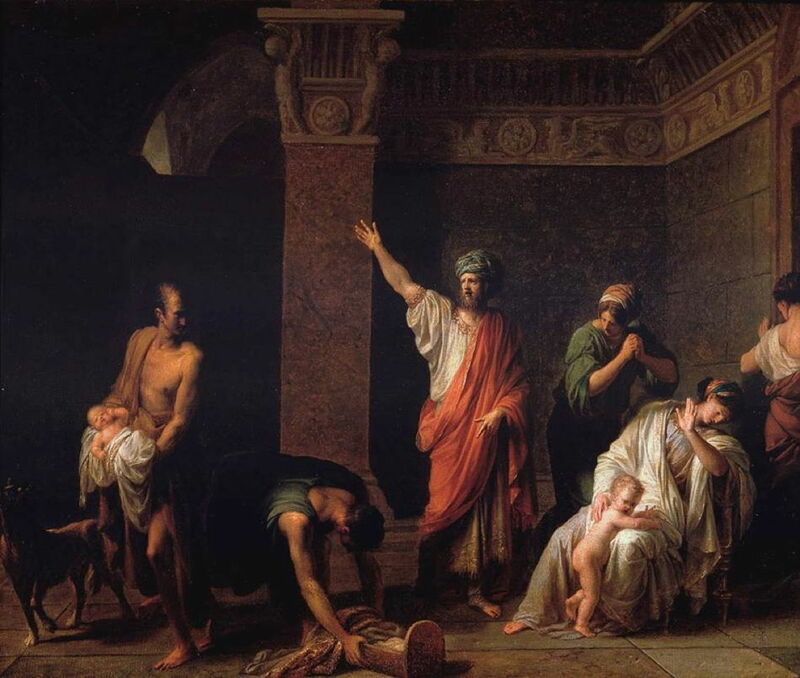 Jean-Charles Nicaise Perrin’s Cyrus and Astyages (c 1790) shows the exchange of infants about to take place, apparently in Astyages’ palace. At the right, Mandane is about to have the infant Cyrus taken away from her, and at the left Mithridates is holding his stillborn son ready to provide as a substitute. When the young Cyrus was ten, Astyages discovered his existence, and returned him to his natural parents to be raised by them. He vented his wrath on his advisor Harpagus who had failed to carry out his command, by chopping the advisor’s son into pieces and serving them to his father at a banquet. Through Cyrus’s great conquests, and serial military successes, there are very few paintings of the King of Kings, although there is one in the Palace of Versailles of a youthful Cyrus in battle, by Claude Audran the Younger. But Cyrus was such a huge influence over many civilisations at the time, that his reign of around thirty years couldn’t slip past entirely unnoticed. Rembrandt Harmensz. van Rijn (1606-1669), Daniel and Cyrus before the Idol Bel (1633), oil on panel, 23.5 x 30.2 cm, The J. Paul Getty Museum, Los Angeles, CA. Courtesy of the Getty Center, via Wikimedia Commons. Rembrandt’s imagination was fired by a story from an apocryphal section of the book of Daniel, and realised in his marvellous Daniel and Cyrus before the Idol Bel of 1633. The young prophet Daniel (of lions’ den fame) was Cyrus the Great’s confidant, according to the book of Daniel. When Cyrus asked Daniel why he did not worship the Persian god Bel (Baal), Daniel responded by saying that he worshipped a living god, and not a mere idol. Cyrus then claimed that Bel too was a living god, and pointed to the offerings of food and wine which were placed before his statue, and were consumed each night. Daniel remarked cautiously that bronze statues do not eat, which for a moment threw Cyrus. But Daniel had exposed the deception of Bel’s priests. 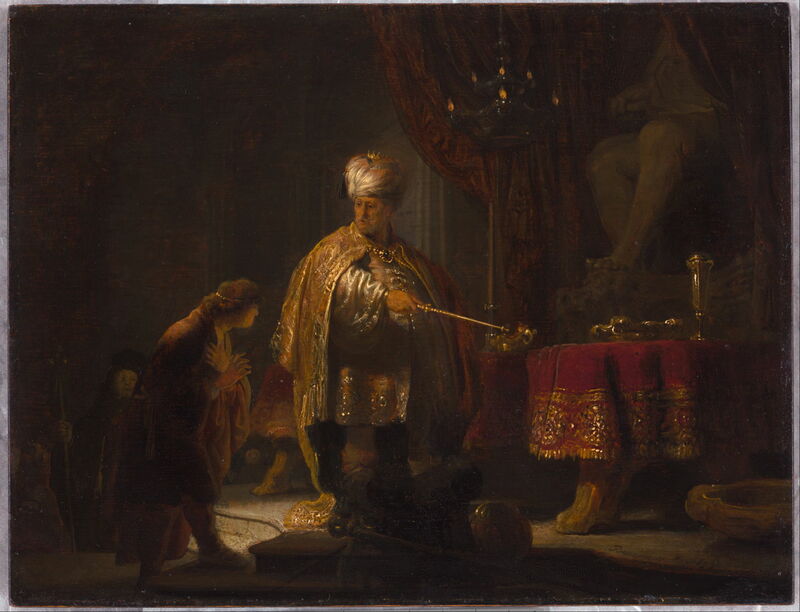 Rembrandt has captured Cyrus, standing in the centre, pointing at the food and wine placed on the altar to Bel, whose huge idol is seen rather murkily at the upper right. Behind the modest figure of Daniel are some of the priests who maintained this deception. Painted in mid-career, this work bears many of the hallmarks of Rembrandt’s late masterpieces. Viewed from a distance, the figure of Cyrus is portly and very solid. In this detail, it is clear how Rembrandt built him up from very painterly marks, which in places are highly gestural. The metallic highlights on Cyrus’s clothing are often no more than rough squiggles and dashes, and in places do not appear to have been made by a brush. Even the king’s face is formed from an assemblage of marks. Daniel and Cyrus before the Idol Bel is one of the less well-known works of Rembrandt which surely deserves to be more widely known and better appreciated. Other than the events surrounding Cyrus’s death (the subject of my next article), his great empire and influence passed almost unnoticed in Western art. There is one notable exception to this: his tomb, which still stands in Pasargadae in Iran (a UNESCO World Heritage Site), has appeared in a few paintings. Pierre-Henri de Valenciennes (1750–1819), Alexander at the Tomb of Cyrus the Great (1796), oil on canvas, 42 x 91.1 cm, The Art Institute of Chicago, Chicago, IL. Wikimedia Commons. The great French landscape painter Pierre-Henri de Valenciennes shows Alexander at the Tomb of Cyrus the Great in this work from 1796. Alexander the Great was not just there to pay homage to Cyrus as the ruler of an empire of comparable size to Alexander’s. Alexander invaded Persia with his defeat of Darius III, and had as a young man read Xenophon’s account of the achievements of Cyrus the Great. The new ruler of Persia had Cyrus’s tomb restored and protected, out of his respect for the King of Kings. How Cyrus came to be laid to rest in that tomb – and the other painting of Cyrus by a great Master – is the subject of the next article. Posted in General, Painting and tagged Alexander, Cyrus, myth, narrative, painting, Perrin, Rembrandt, Ricci, Valenciennes. Bookmark the permalink.